Jasper is home to the famed Columbia Icefield and rugged, rocky snow-capped peaks. It's a place every North American should see. The town of Jasper has tourist facilities but is smaller than Banff, its cousin 165 miles to the south. Hinton is about 80 km. (50 mi.) from the town of Jasper and offers a few chain hotels. It's on the road to Edmonton. Jasper has 13 campgrounds within its boundaries, representing a wide variety of services and comfort levels. Whistlers offers the widest array of services at $38/CAD night. Others come down from that price to as low as $15.70 for primitive sites in more remote areas. Backcountry permits cost $9.80. If you'll be in the area for more than a week, an annual permit is available for $68.70. Backcountry passes purchased in Jasper are also good for Banff, Kootenay and Yoho National Parks. Once you've paid your entry fee, there are scores of thrilling sites to experience that won't cost any additional money. The Icefields Parkway's northern terminus is the town of Jasper, but it extends to the southern park boundary near the Athabasca Glacier and into Banff National Park. Here you'll find dozens of pull-offs, hiking trailheads, and picnic areas amid some of the world's best scenery. Two trademark Jasper attractions are the Athabasca Glacier and Mt. Edith Cavell. It's possible to pay big fees to ride a motorized vehicle onto the glacier, but standing behind a cable line and seeing it costs nothing. Please don't venture onto the glacier on foot. Crevasses (deep cracks in the ice) are hidden by snow. Each year, visitors fall into a crevasse and die from hypothermia before they can be rescued. An extensive visitor center directly across the parkway explains glaciers and a history of Athabasca in detail. 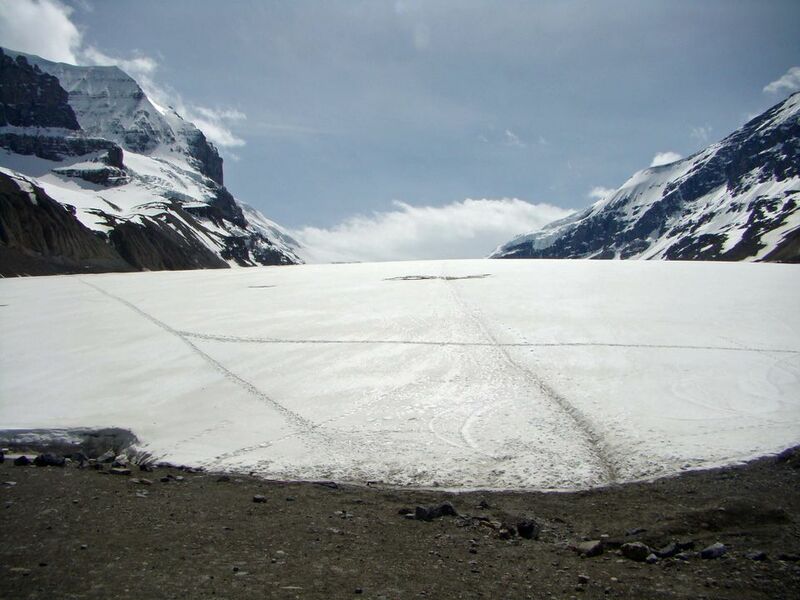 This glacier is part of the larger Columbia Icefield, which is 325 sq. km. (200 sq. mi.) in size and receives up to 7 m. (23 ft.) of annual snowfall. Mt. Edith Cavell rises more than 11,000 feet above sea level and features a hanging glacier on its north face. There is a system of trails around the mountain for hikers of various abilities. Inquire locally about the conditions of any hiking trail before setting out, especially during spring or fall visits. Parking is generally free of charge but can be hard to find during peak season at many trailheads and scenic pull-offs. The major roads across the park are Highway 16 (east-west) and Highway 93 (Icefields Parkway) which connects to Lake Louise and Banff to the south. Canadian national park entry fees do not apply to people simply driving across a park with no intention of stopping. But when you actually visit the overlooks, hiking trails, and other attractions, adults pay a daily fee of $9.80 CAD, seniors $8.30 and youth $4.90. This adds up quickly, but fortunately, you can pay a fixed fee for your entire carload of $19.60 per day. The fee can be paid at visitor centers, and for convenience, it's best to pay for all the days at once and display your receipt on the windshield. Those who try to avoid paying the fees become subject to big fines, so don't try it. The fee entitles you to visit any Canadian national park during the time it's valid. The nearest terminal isn't really near at all: Edmonton International is 401 km. (243 mi., four hours of driving) from the town of Jasper. Calgary International Airport is 437 km. (265 mi.) from Jasper townsite. Keep in mind that Jasper National Park covers a very large area, so some parts of the park could be closer to the Calgary airport than to Edmonton. WestJet is a budget airline serving both Edmonton and Calgary. For more information, visit Jasper National Park within the Parks Canada Web site. Banff is one of Canada's most perfect little towns. Find out why. Planning to Visit Canada's Kluane National Park? Read This! This wee Canadian town is one of Canada's top attractions. Here's why. What Do You know About Ivvavik, Canada's National Park?